I sometimes have Adult Dogs looking for Retirement Pet Homes. This is one of the hardest decisions that I have to make for my dogs, so I do not expect to hear from timewasters. If you genuinely believe that you can offer a permanent, forever loving home to one of my beloved doggies, please contact me. 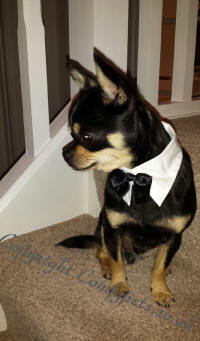 Please check my Pups Available Page to see the Pups I currently have for sale. If you are not quite ready for your new puppy, contact me for details of my waiting list for future litters. It would be helpful to include details about yourself and the home life that you are offering to one of my pups. 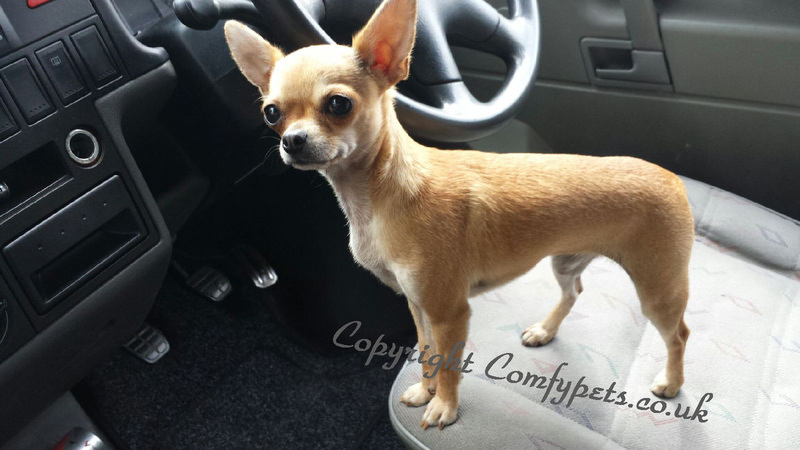 Chihuahua Pups available. Pics and more details coming shortly. Contact me for details about my waiting list. due end April/beg May 2019. Plus, my very 1st litter of Toy Schnoodles. I am a Licensed Breeder. All of my pups are conceived, whelped & reared in my home with 24/7 care, many years experience and full veterinary support as required. If you would like to be considered for one of my pups, please email me in the first instance with details about yourself and the home-life that you are offering to one of my pups. I always keep in stock 24" Crates/Cages for £30 (choice of Black, Baby Pink or Baby Blue). These are a perfect size for a Toy Breed puppy through to adulthood so will last you a lifetime. Crates are worth their weight in gold, they are perfect for house training and provide your pup/dog with a safe haven to relax and sleep. Puppy Pens £30 (Black). Pens are perfect to keep your pup safe and out of mischief if you have children, or need to take your eyes off them for a short while, or need to contain them in an open plan house for example. If you purchase both a Crate and a Pen together the total cost for both is £55 (saving £5). You can place the crate inside the pen, so that the pup has his own little territory. Quality Fabric Puppy Carriers (Pink or Blue) for the journey home are £20, they are also useful to take pup on regular car journeys to get him used to travel, for vet trips etc.. and are much safer than allowing your pup/adult to travel unrestrained in the car. I also always have in stock Washable/Reusable Fabric Toilet Training Pads from ����20 p/pair. I have been using these for years. I find them much better than disposable training pads, as pups' like to drag those around and chew them up, the fabric pads wash and tumble dry very well, they keep your floors protected from little accidents, they cannot be chewed up and last for years. Newspaper can be very messy and smelly and does not protect your flooring. Disposable Toilet pads can get expensive and messy as pups love to tear them up into pieces and drag them all over your floor. If you pop out for a short while , when you return it looks like it has been snowing as pup has destroyed the pad and the cotton wool type filler is everywhere, and needleless to say, if they have had a little toilet accident in the meantime, it will be on the floor, or chewed and spread around the room in the trashed filling.. These Washable, Reusable fabric pads are the answer. The top layer allows liquid to pass through whilst it remains dry, and is locked away in the middle layers. The waterproof polyurethane backing prevents penetration of the liquid onto your flooring. 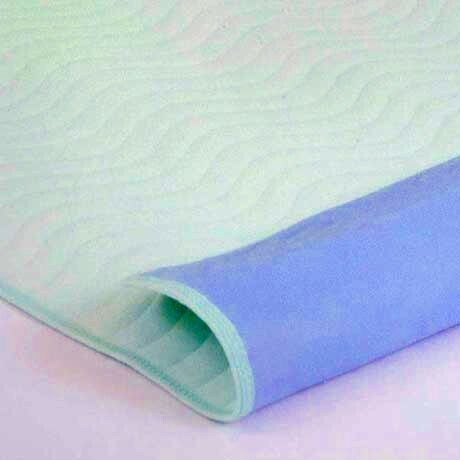 Cost effective and reliable, this product has been designed for long term use and can be washed, tumble dried and re-used over and over again. Place one pad in your puppy pen or at the back door. I sell them in packs of two to my new puppy owners, so that they can have one in the wash, and one on the floor. I do provide a pack of disposable training pads in with my Free Puppy Packs, to get you started, but these fabric pads really are the bees knees when it comes to floor protection. I keep getting asked "Are the puppies going to be small Adults?" . I breed Chihuahua pups of various sizes, from Teeny Tiny's (often referred to in the media as teacups, but really there is no such thing as a T-Cup, a Chihuahua is a Chihuahua, whatever its' size) to large Standard Size. 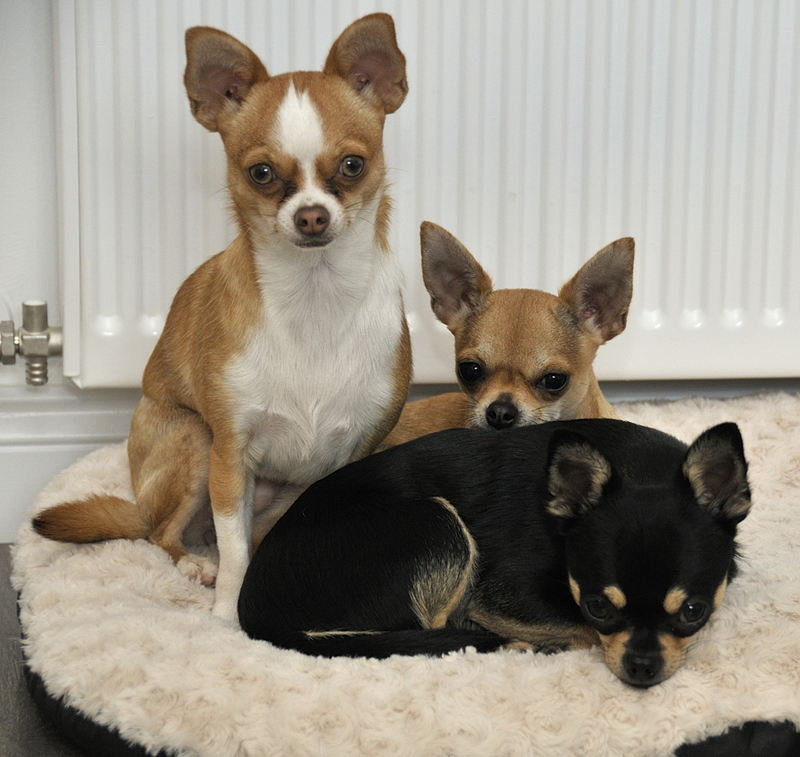 The pictures below, kindly sent to me by Dee and Joe, the owners of three of my precious pups (Thank you Dee & Joe for allowing me to add these pictures to my website :-) ) are 3 dogs from different litters and are different ages. Gucci, the doggie sitting on the drivers seat is the oldest of the three doggies and she is a teeny. The black/Tan Chihuahua is Hugo, he is very small and the Orange and White Girl is Chanelle (Nellie for short), although she is the largest of the three, she is also a very small adult. My pups do not leave me until they are at least 8-9 weeks of age, and more usually they are at least 10 weeks of age. (If you are ever offered a pup from somebody who is selling them under 8 weeks of age, walk away! the pup is not physically or mentally ready to leave for it's new home at that age, and you may end up with a problem dog which has either health issues or psychological difficulties as a result, and above all, it is immoral for somebody to let such a tiny breed leave at that age, they are obviously not breeding for love, and obviously do not have the time or patience to do right by the litter. The chances are that the litter may well not have been looked after properly from birth, or even conception, they have probably never seen a vet, and are probably not wormed properly (if at all). The longer a pup stays with it's mum and siblings, the more confident, healthy and ready it will be. If my pups are not ready at 9 weeks of age, whether due to their size or because I feel that they need a little longer with their mum, then I will keep them as long as necessary until I feel confident that they are ready for the big wide world outside. 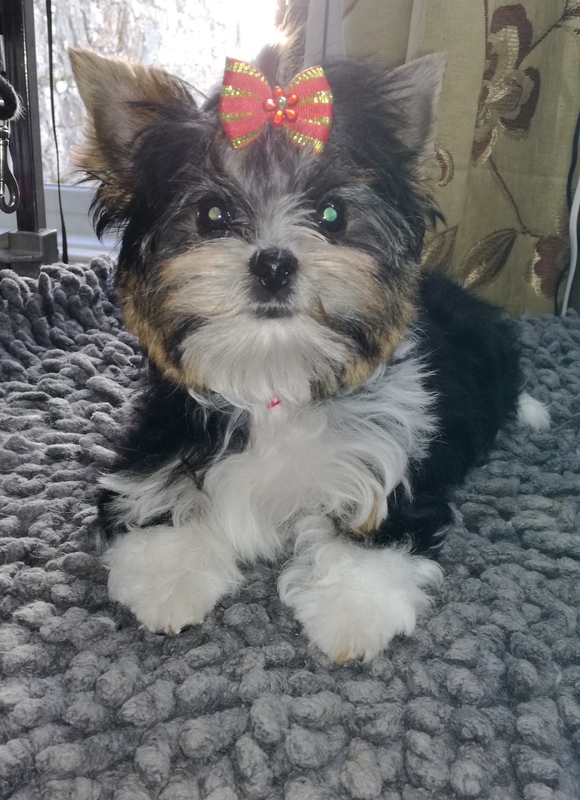 I do feel that 10 - 12 weeks is a good age for a small breed pup to start integrating with their new family, and is both mentally and physically capable of taking on the new world that is being offered to them by their new owners. For your own Peace of Mind, I provide as standard, 4 Weeks Free Insurance with every pup. This has to be the most responsible way to sell a pup, and it gives peace of mind to the new owner and to myself, the breeder. 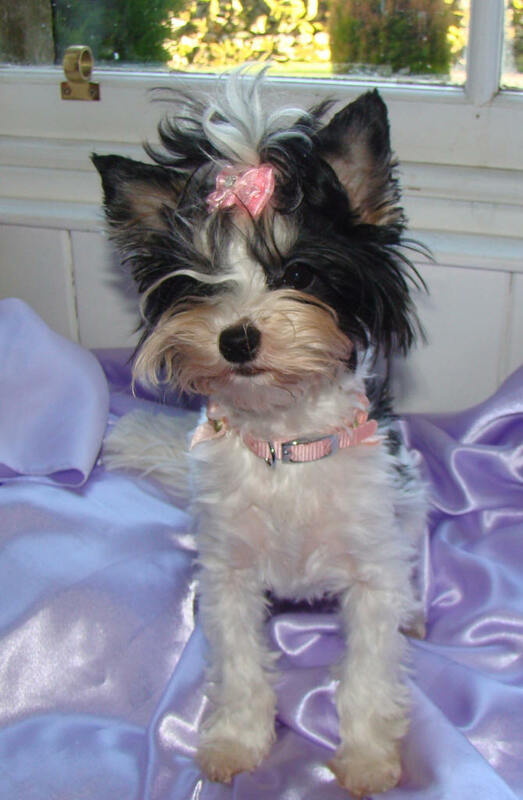 My pups are Wormed and Flea protected correctly to date using veterinary products. You will receive a complete record of the date undertaken, weight of pup, products used and amount used. 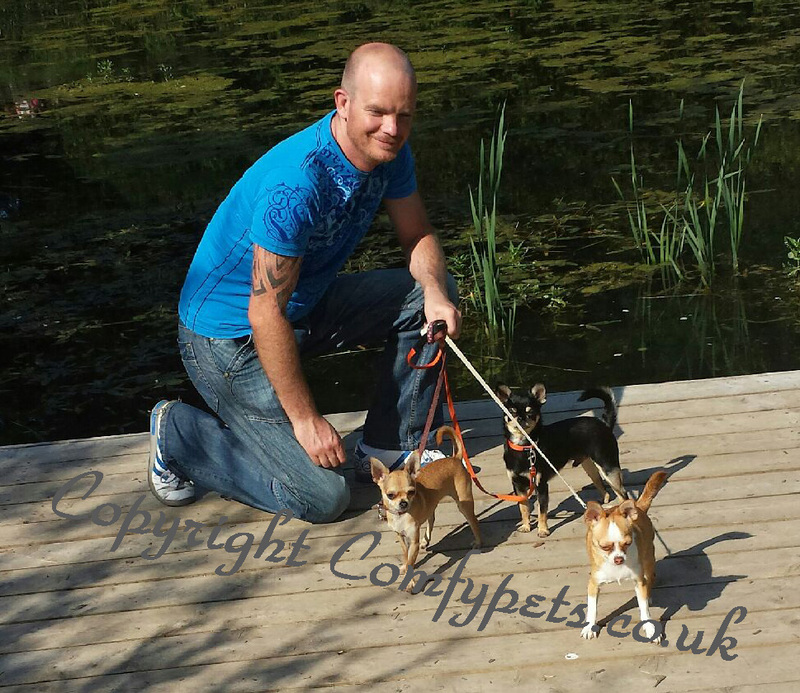 My pups are always born and reared in my home, without exception, and are introduced to many household and outdoor noises and are well socialised with other adult and young dogs of different breeds. Toilet Training is initially to Toilet Pads (I have been using washable, reusable toilet pads for years and they are the bees knees). I start getting them used to going outside to toilet (weather permitting) before they leave also. I also keep in stock suitable sized crates, puppy pens, travel crates, washable toilet pads, and if you are that way inclined, I also have a huge stock of cute little hand knitted Jumpers, T-Shirts, Winter Coats, Jackets and such like to keep your new pal in trend and warm. Lifetime advice after care is offered and provided to all new owners if required. As my main objective is to provide my new owners with happy, healthy, sociable and confident companion pets, I am afraid that I am not able to provide any advice on breeding, I just do not have the time to hold people's hands throughout the whole breeding process, there is far too much that you need to know. I have been breeding for many years, I know that I also had to start somewhere, but what I know, and what I still do not know, takes years of learning, if you want to do it properly, I cannot possibly just hand it all on a plate within a half hour conversation, there is just far too much that you need to be aware of if you wish to embark on breeding. Much as I would love to spend hours on the phone discussing breeding, my own dogs and my own breeding keeps me extremely busy from the second I open my eyes in the morning, to the second my head hits the pillow. So if you do wish to breed, I suggest that you obtain many a good book, speak at length with your own vet, and please tell me what your plans are because I can then provide you with the most suitable pup with breeding potential. Yes, I will sell my pups to people wishing to breed, but, PLEASE be honest with me from the outset. If I know you wish to breed at a later date, whether it be just one litter, or if you are an experienced breeder looking to enlarge your gene pool etc... Just Tell Me!!! I do not bite... If you are deadly serious about this, you need to ensure that your new pup has the potential to breed successfully, otherwise you are wasting your time, and starting off on completely the wrong foot. And if you know that you want to breed and tell me otherwise, I then sell you a pup that may be too small for breeding or there may be some other reason why the pup should not be used for breeding, you are then putting your dog's life at risk and the potential pups' lives at risk, not to mention the cost of dealing with breeding problems. Insurance will NOT cover you for ANY illness/injury/Loss/Death etc... as a result of breeding, so you could end up with a huge Vets' Bill and no pups and/or no adult dog to show for it. So, PLEASE BE HONEST WITH ME!!!! and I will help you choose the best pup for your own circumstances. But you need to help yourself also, I cannot help you if you have no intention of researching/reading/learning about breeding in great detail before you start, I cannot help you if you are a planning to breed with absolutely no intention of being at home for your pregnant girl (if you work full time, if you take regular holidays or time away etc etc..) I do not have the time to pick up the pieces when things go wrong for you because you were irresponsible. So, I say again, PLEASE be honest with me!! and I will help you choose the perfect pup..
A Non-refundable deposit of £150 will secure your chosen pup until s/he is ready to leave. My pups are very happy, healthy, well adjusted, well socialised pets. I encourage viewing of pups at my home to see them in their own environment with mum and siblings. Viewings are by appointment only. Most viewings are arranged for early afternoon as mornings are my busiest time of the day with my dogs. My pups can only be viewed once they are at at least 5 weeks of age. I like to know where my pups are going to, therefore I am not the sort of breeder that can't wait to see the back of them and sells them willy-nilly to the first person throwing cash at me. I will keep my pups as long as necessary in order to wait for the right person/family to come along who is providing a permanent, loving home. I try my hardest to ensure that the new home is right and suitable for one of my puppies. When you initially contact me, can you Please provide me with some details about yourself and the homelife that you are offering to one of my pups. I do not need you to write an essay, but please do not be offended if I respond with more questions. The future happiness and longevity of my pups must come first when placing them in their forever homes. My dogs and pups are Bred and Brought up with experience, knowledge, care and love. 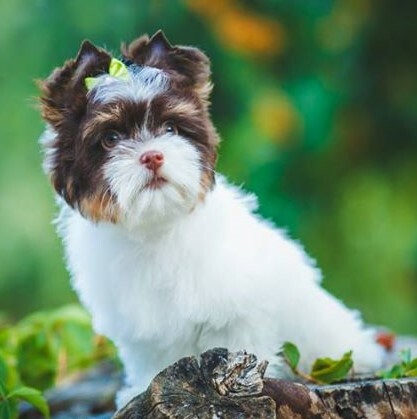 Be confident that I am a fully licensed breeder and I strive to breed pups for excellent temperaments and health which are reared with round the clock human companionship and care. I will not breed from a dog that is not 100% fit and healthy and I would never breed from a dog that may produce hereditary problems (for example weak knee joints, eye problems, teeth/jaw alignment problems etc.) I treat all my dogs equally and all are cared for with Love. They want for nothing, have the best of everything and are well socialised from birth. I may have a lot of dogs compared to the average person, and having 4 different breeds of dogs can be seen as somewhat strange to people on the outside looking in, but please do not judge me badly for this. My goal in life is to breed the perfect healthy happy pup for companionship, and as I suffer with severe animal allergies, I have been able to surround myself with dog breeds that do not affect my allergies, and I hope that my labours of love will also help other people with dog allergies to achieve their dream of owning their own dog that also does not affect their allergies. I do not have any children, I do not socialise, I do not do holidays, I am literally here for my dogs 24/7/365. My dogs are my life. From the second I get up in a morning to the second I go to bed at night (more often than not it is early morning by the time I get to bed) I am doing something with/for my dogs. Each and every one of my dogs has a name, each and every dog knows their name, and each and every dog comes to me when called. Each and every dog has their own food bowl and is fed individually in accordance with their own individual needs, even if that means giving one something different to another. I know exactly what and how much each of my dogs eats, and I know exactly what each and every dogs' poop looks like when it comes out the other end, on a daily basis. They eat the best food I can give them, they all have heated beds and have lots of space in our rural location to run and play and enjoy life. 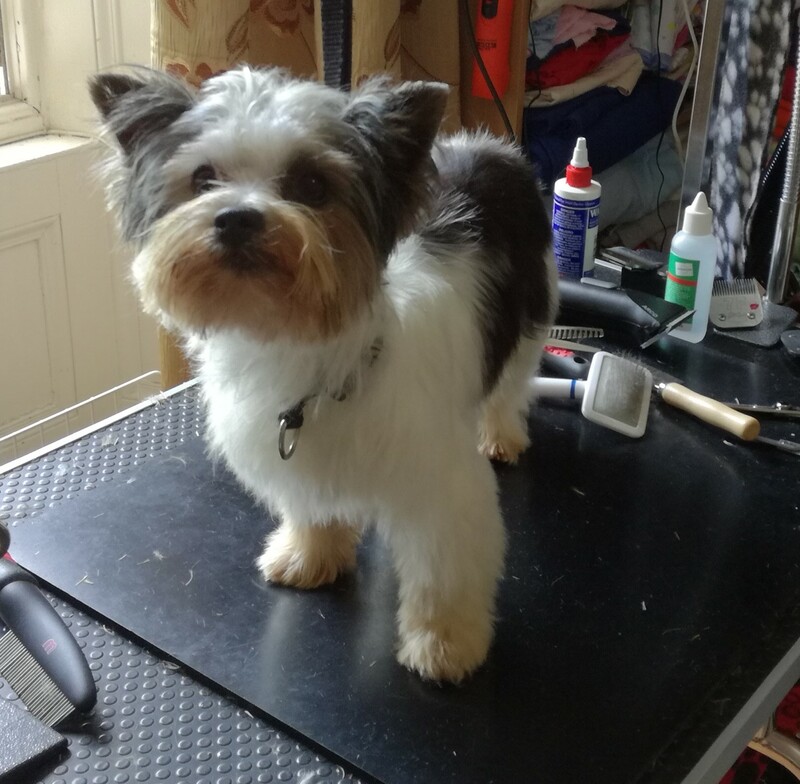 I groom all of my own dogs, even those that need clipping regularly, they are all vet checked regularly, up to date with all annual boosters, wormed at least once every 2 months, flea/tick and ear mite protected and I spend an absolute fortune on treats and toys, blankets and bedding for all of my dogs. We have a tumble Dryer and Washing Machine specifically set up for our dogs, and they both run for a minimum of 8 hours a day so that we can provide fresh and clean bedding daily to all of our dogs. 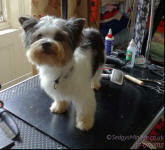 All of my Dogs are Pedigree and I also have some which are UK Kennel Club Registered. I mainly have Pedigree pups available for sale as pets (not for showing purposes) and occasionally have KC Breed Register pups available also. 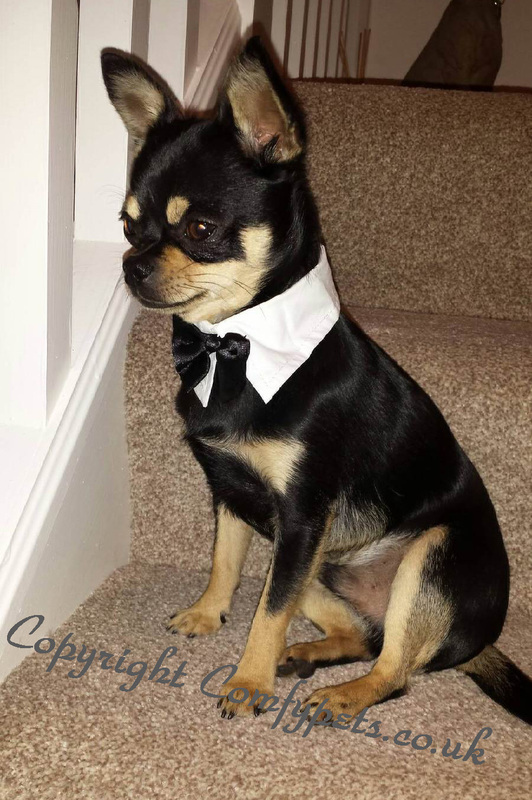 If you do not wish to show your dog professionally or as a hobby, and are looking purely for a family pet/companion, your puppy does not need to be KC registered on the breed register, therefore I register them onto the Companion Register. I can guarantee that all my dogs are full pedigree bred. Both parents can be viewed alongside my litters at my home. Kennel Club Companion Registration is approved on purchase (signed by new owner) and Official Registration is provided to the new owner direct from the Kennel Club. Matings between my girls and Stud Dogs are undertaken under strict supervision only. When my girls are in season, they are only allowed exclusive access to the Stud Dog who will be used to serve her and will be kept out of any contact from my other Stud dogs for the duration of her heat. I will honour any request for DNA testing to determine the Sire and Dam of a pup if so required, but I am 110% confident that you will find that the parents are who I say they are. It is nice to keep in touch with new owners of my pups where possible to ensure that the pup is being well cared for and developing well and is settled into his new home. Photographs of my pups as adults are always welcomed. I do get returning owners for my pups, which is a recommendation in itself, and an honour. If a pup does not or cannot settle into a new home for whatever reason, I do have procedures in place to either take the pup back or assist in rehoming as necessary. In fact, if it should be the case that a new owner cannot keep one of my pups for whatever reason, I would prefer that they told me and let me help than lose contact and wonder whatever became of the pup that I was responsible for bringing into this world. Advice and Information is always available at the end of the phone or email if so required for any of my pups' new owners for life. I have an excellent relationship with my Vet. All my Dogs are fully up to date with vaccinations, worming and flea treatments and I do seek veterinary assistance for any ailments, illnesses etc. as required, whatever time of day or night. I am happy for my pups to go to homes with other pets, including other breeds of Dogs, Cats, Rabbits etc etc etc Although I do expect the new owners to be responsible in introducing pups to existing family pets, and I am able to offer advise on this. 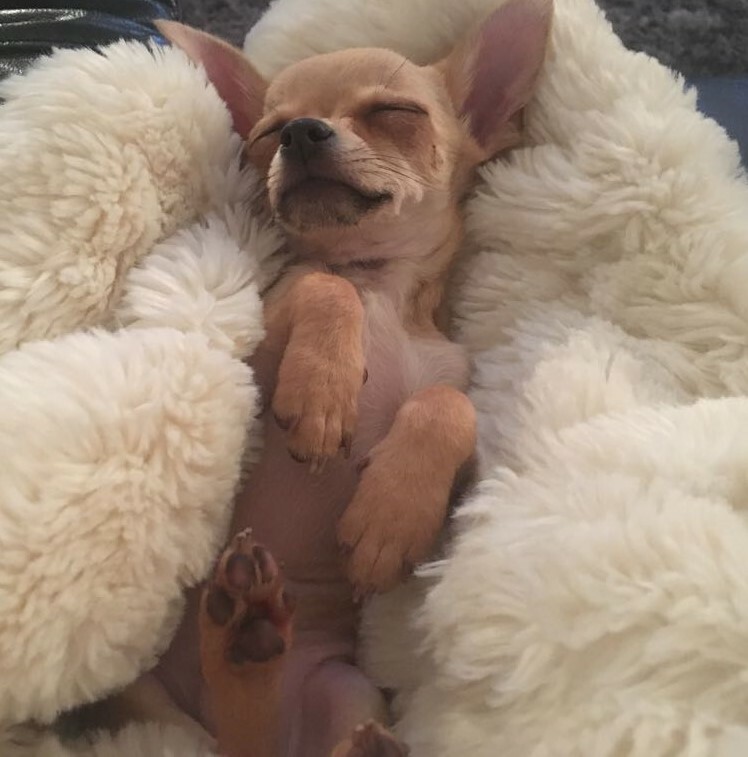 My pups do settle well into new homes with other pets, please take a look at the photographs provided in my Testimonials section to see just how well they do settle. 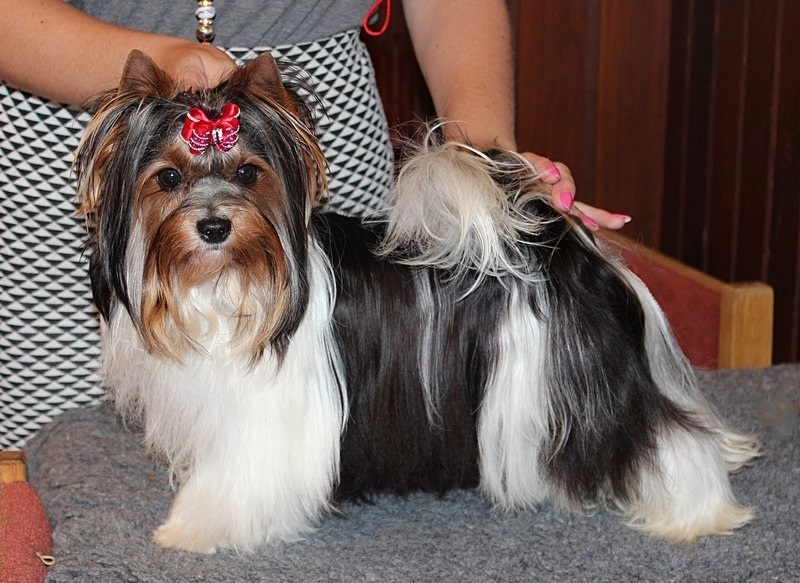 Due to the size of a Toy Breed Puppy, not all Breeders will allow their pups to go to new homes with young Children. I am actually happy for my pups to go to new homes which have children, on the strict understanding that Kids MUST be supervised at all times when the pup is in their company. Again, I do expect parents of young children to be particularly responsible in terms of supervising pups and kids at all times, and will advise on this prior to purchase. If I do not feel that the family is suitable for the pup, based on the chosen pups' temperament and personality and size etc. then I have to think of the wellbeing of the pup first and may either prefer that you do not have one of my pups, or ask you to choose a different pup which I feel may be more suited to your family life. If I do have exceptionally small pups, or pups which are not so extrovert, I will prefer that they do not go to homes with very small children or overly excitable children and this will be noted along with the pups ad. Why am I happy to consider families with young children, when many breeders do not ? Because I know that there are responsible adults with young children who will only want the best for the pup, and will do everything in their power to ensure that the pup and children are brought up to respect each other. I also wanted a Chihuahua as a very young child, and was never allowed a dog as my mother does not like dogs. So I know exactly how it feels to have a family without pets and it feels like their is something missing in your life. In my mind, every family should have a pet and so long as you are responsible, there is no reason why a Chihuahua or other Toy Breed cannot become that pet. Toy Breed pups are not naturally scared of children or snappy with children, if they are brought up being socialised around well behaved children and are taught the ground rules from the beginning, both child and dog can both have a very long and happy, strong relationship together. My own dogs do not live amongst children, as I personally do not have children (my dogs are my babies). therefore my dogs have not been socialised with children at any point in their lives. As such, when you come to view my pups, if you do bring your children along with you, please do understand that I will not allow my adult dogs to be in the same room during viewing. I am sure that most of my dogs will be absolutely fine with children, but I have to be responsible, and feel that it is kinder to my dogs, and to the children visiting, that my dogs are kept out of the way. Adult visitors are of course more than happy to meet my adult dogs. Most people that come to my home end up settled on the floor allowing my adult dogs to greet them and get acquainted, my dogs love the attention, I often find it difficult to tear people away from my house, they have so much fun with my dogs. Following my absolute horror and disgust on learning that 2 different sets of parents thought it was perfectly acceptable to pop one of my pups into a small dark cardboard box, wrap it up in gift wrap, and put it under the Christmas Tree for their young children to find on Christmas morning 2016, whilst videoing the event for parading on social media, then continuing to socialise, party and shop throughout the holidays with no regard or common sense for the new pup's needs, I am afraid that I am no longer able to allow my pups to leave me for their new homes during December in the run up to the Christmas Holidays through to 4th Jan, no matter how responsible the new owner appears to be, and regardless of whether there are children in the household or not. If I should have any of my girls in season that would mean them having pups ready to leave during this period, I will either not breed them, or I will keep the pups with me until after the New Year once all festivities and excitement has subsided. I should add, that these 2 particular sets of parents were not last minute puppy purchasers (I would never sell a puppy as a last minute Christmas surprise), both had been on my waiting list for several months, had been well vetted, and prior to purchase they gave me no cause for concern with regards being responsible or having common sense. Become my Facebook Friend or Follow me on Twitter. I am not always in a position to answer my phone. Best way to contact me is by Email, WhatsApp or FB Messenger. Please could you provide your first name when writing to me. I read & reply to all messages late evening once my Doggies are tucked up in their beds. Copyright 2010. With All My Heart. All Rights Reserved.